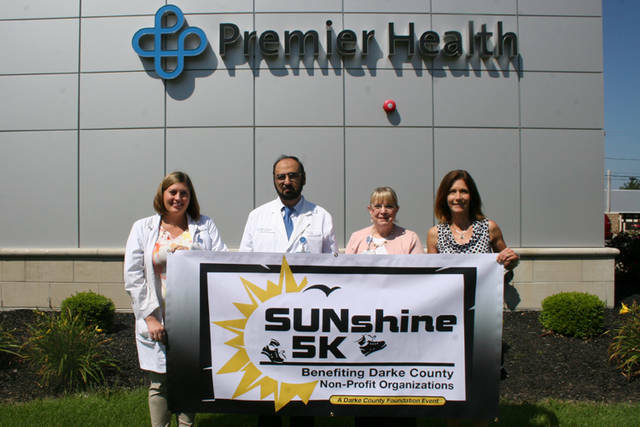 Premier Health is a major sponsor of the SUNshine 5K on Saturday in Greenville Park. Pictured (left to right) are Chelsea Polleys, CNP; Kamran Riaz, MD; Diane Ewing, chief communications officer for Premier Health; and Christy Prakel, director of the Darke County Foundation. GREENVILLE – The community is invited to Greenville City Park at 8:30 a.m. Saturday for the annual SUNshine 5K Run/Walk, hosted by the Darke County Foundation. Premier Health is a major sponsor of the event. Walk-in registration begins at 7 a.m. at shelter No. 3 on Harmon Drive. Entry fee for ages 15 and older is $25 (limited shirts available). Registration for kids age 14 and younger is $5 (no shirt). A free kids 800-meter fun run is at 8:15 a.m. Proceeds from the SUNshine 5K will benefit these local non-profit organizations: AddieGirl for Cancer Association of Darke County, Ansonia H.S. National Honor Society, Big Brothers/Big Sisters of Shelby & Darke County, DeColores Montessori School, Edison Foundation and St. Mary’s School. Premier Health is a leading healthcare provider in southwest Ohio. Its Greenville facility, the Good Samaritan Health Center, is located across from Wayne Healthcare at 742 Sweitzer St. The facility houses the cardiology practice of Dayton Heart Center Greenville plus other medical specialties.